Beautifully engraved certificate from the North American Edison Company issued no later than 1938. 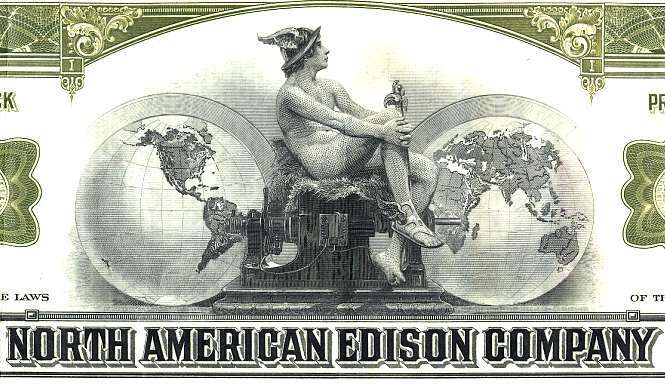 This historic document was printed by the American Banknote Company and has an ornate border around it with a vignette of an Mercury flanked by two globes sitting on a power generator. This item is hand signed by the Company�s Vice President and Assistant Treasurer and is over 65 years old. 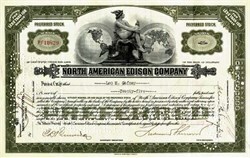 The North American Edison Company was controlled by the North American Company. The company owned the Union Electric Light and Power Company, St. Louis and a 77% interest in the Cleveland Electric Illuminating Company.